Simple Country Living. : Acupuncture, A First For Me. Acupuncture, A First For Me. Over the last few weeks, I have been having physiotherapy at my local minor injuries hospital to help with my knee problem. About two weeks into my treatment, I was chatting with my lovely physiotherapist about how the treatment was going and I happened to mention to her that I was having problems with my foot, the foot on the same leg as my bad knee. After a lot of poking and prodding, it turns out that it is almost certainly my foot that's has been causing most of the problems with my knee. Apparently, I have a bit of an imbalance as a result of the pain in my foot, caused, most likely, by arthritis and it's that imbalance that has caused my knee problems because I walk "funny" ..... not a technical term but you get what I mean. Each week, my physio has massaged and manipulated my foot, she has used ultrasound on the affected area and has given me exercises to do to loosen up the joints and it seems to be working. Then, at my appointment last week, she suggested I try acupuncture and strangely, I found myself hesitating. I know she is fully qualified and that many people swear by it, even my mum has had acupuncture in the past and has said it was very helpful and in principle, I think it's a good idea. Frankly, if it helps ease the pain in my joints it has got to be a good thing. I'm not even squeamish about needles but last week, I found myself making excuses as to why I couldn't do it that day and then praying fervently that when I turned up today, she would have forgotten about it. Excuse the ugly feet ........ I snapped a quick photo with my iPad, because I wanted proof for my mum that I had actually been brave enough to try it. I have had acupuncture and found it very effective, it is a shame you can not have it to lose weight. I have been told it is good for hot flushes, I may try to be brave as well and give it a go. Though it's not completely known how acupuncture methods works entirely, however researches have pointed that acupuncture lorne park improves the production of endorphins that makes the entire body feel completely relaxed and help reduce stress. You are quite brave for trying something that you are very afraid of from the start, and it definitely paid off. 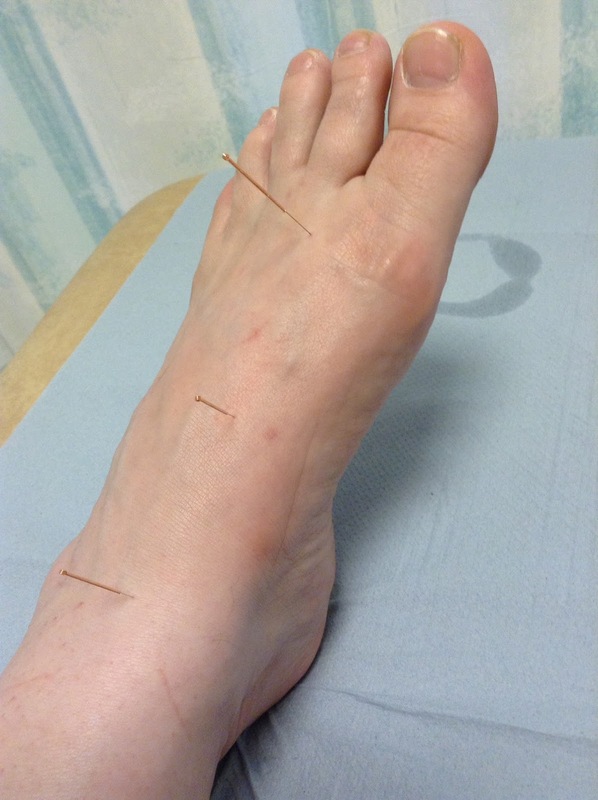 Have you tried more acupuncture sessions after this? If you keep continuing, I’m sure your feet would feel a lot better than your first acupuncture session. Thanks for sharing the experience!